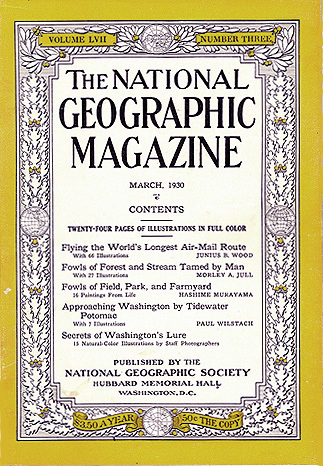 National Geographic Magazine from March 1930. A perfect example of the greatness that was National Geographic in the 1930's...articles on "Flying the World's Longest Air-Mail Route", "Fowls of Forest and Stream Tamed by Man", "Fowls of Field, Park, and Farmyard" (featuring 16 Hashime Murayama paintings), "Approaching Washington by Tidewater", and "Secrets of Washington's Lure". Splendidly illustrated and written issue, in VG condition with very minor edge wear. Plenty of old ads for steamship lines, railways, and one of a lithe young lady in a wispy dress using her new Cooper power lawnmower! Early radio comedian Phil Baker appears mighty slick in an ad for Barbasol! Magazine dimensions 10" x 7". Only one in stock.